I love Christmas. I love being bundled up, hot beverages, midnight mass at the church I grew up in, getting those glossy postcards and typed annual summaries from far-away friends…. and I LOVE getting to see my mom, dad and sister in San Diego. I think hard about what kind of year they have each had, and what I might make or buy that will brighten their Christmas morning. That moment when they unwrap something I made or picked out for them- and I see them light up a little? Yep, I love that. I love giving presents to the people I love. 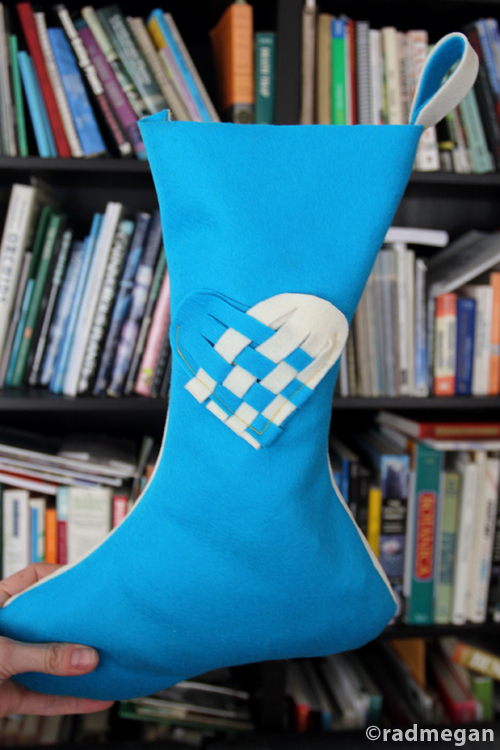 What’s in this radmegan stocking o’ cheer, you ask? 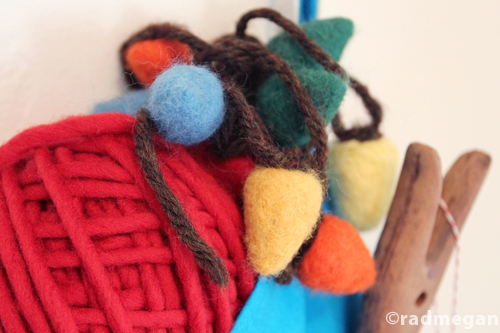 One of my Needle-Felted Reindeer ornaments…. My 10+foot strand of Needle-felted Christmas Lights! 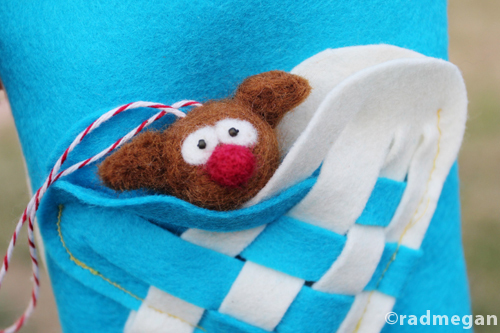 I mean, how can you resist this reindeer face? You need to win this give-away! All this radmegan-made stuff could be yours!! 3. Followed radmegan on Twitter! 8. Shared with me: In the comments below, tell me about a post of mine you have tried. I love hearing from you! Extra Credit: Tell a Friend…. This is on the honor system, but I’d sure love it if you told one friend about my blog. On Thursday morning, I will go through all of the comments in this post, and randomly select one grand prize winner..
OH, BUT WAIT- THERE’S MORE!!! I will ALSO be giving away ONE radmegan-made needle-felted Santa Claus ornament and ONE radmegan-made needle-felted Elf ornament to TWO lucky runners-up! THAT’S RIGHT!! THREE PEOPLE CAN WIN! See how much I love giving presents?? 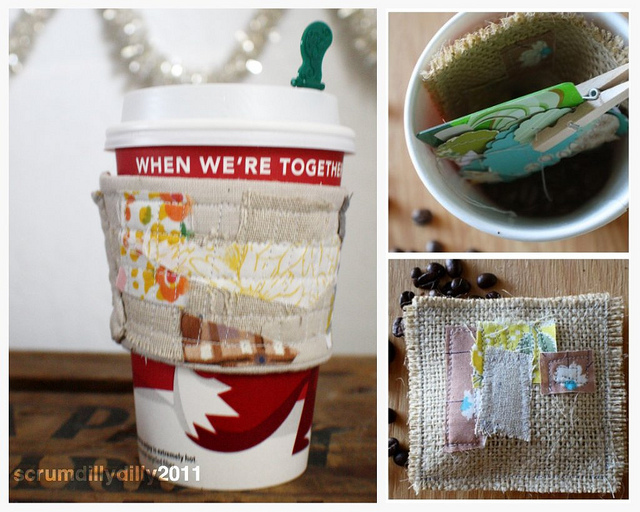 And by the by, I’m not the only crafter on the block with a holiday give-away today! 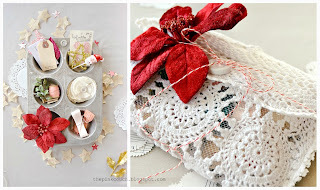 Tara from www.thepinkcouch.blogspot.com has made this lovely lace holiday bag stuffed with all sorts of beautiful goodies! 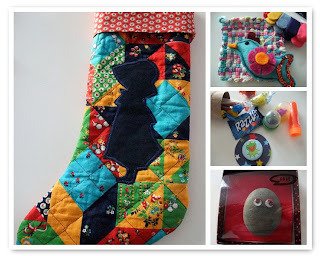 Jennifer from http://thefeltmouse.blogspot.com made an adorable stocking inspired by the 60’s & 70’s! And my pal Jessica from http://scrumdillydilly.blogspot.com whipped up this cute coffee-lover’s dream of a stuffed-gift! So if you are as much a fan of getting gifts as we are of giving them, feel free to swing on over and check out there blogs too! 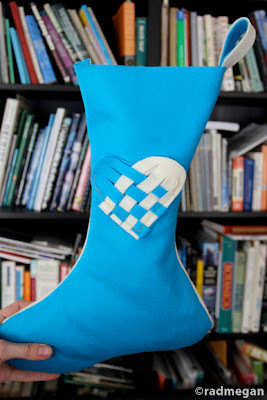 And good luck in the radmegan Stocking o’ Cheer Give-Away!! THIS CONTEST IS NOW CLOSED. WINNERS ANNOUNCED HERE! love all that you do and how cool do our combined efforts look up there? super cool! yay! I am a follower, I enjoy your photos and all of your goodies. I’m a Follower and Christmas is my birthday! I love this time of year and I love all your projects. 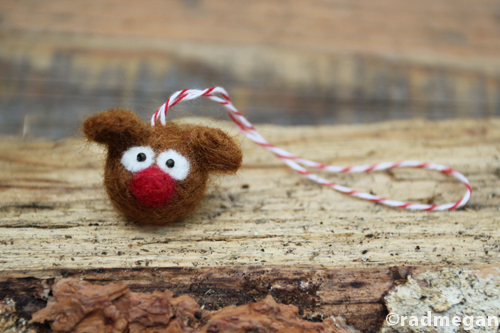 My mother and I started needle felting not too long ago and she would LOVE all your little ornaments! And I follow on FB – how I discovered the contest! I am definitely a follower and would love a chance to win your lucet as well as all your other goodies. Not sure if your giveaway is available to overseas followers (I’m in Australia) but hey, if not, no biggie, am happy just to share the love!! I tweeted about the competition and tagged you in the tweet so you could see it (https://twitter.com/#!/Narrabrite/status/145699129107021825)! As for my favourite posts – so many to choose from – but I am still busting to try the cedar plank salmon, I LOVED the string gardens and as for that peppermint bark that you made for your sister, what can I say – ambrosia!! Finally for some extra unasked credit, I thought that since I first found you on Pinterest I would go back there – I followed all of your boards, and then pinned a link to this page and tagged you in it (here’s a link http://pinterest.com/pin/111112315776174320/) and then just for fun I also tweeted that one! Crikey – I’m beginning to become that kid in class that we all hate, but hey, I love my daily emails from radmegan and anything I can do to help spread the love is a pleasure! I definitely “Like” radmegan on Facebook! You’re in my Etsy circle – PooknflipProductions. The last post I tried of yours was one of your recipes. I can’t remember exactly which one – but it was a muffiny/bready something and it was delicious. And I cannot wait to try your stuffed cabbage recipe you shared in the Viennese recipe post. Still haven’t gotten to it. Now following your blog…. lovely giveaway! I`m following you in Google and I`m subscribed to your blog. I’ve never used a knitting fork. 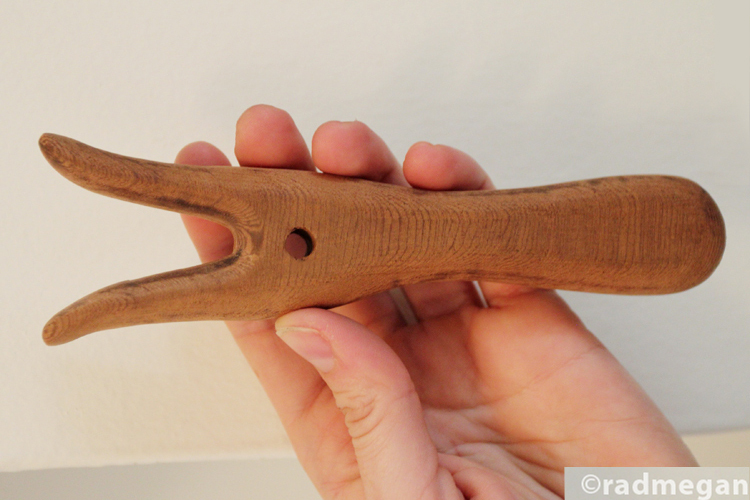 I think I’ve achieved the same effect with fingers, but I bet you get a lot less rope burn with the fork. I’d love to try it! I really want that fork! I’m following on Twitter now too. I am now following you on GFC (as well as RSS). Eek, so many amazing things! 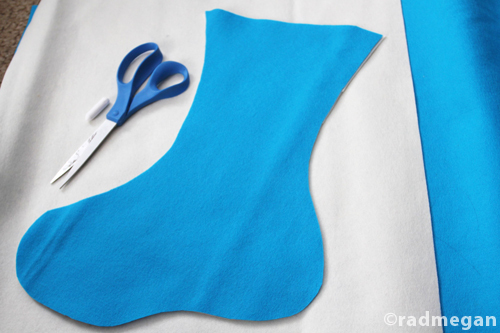 You do beautiful work I’ve used your tutorial on danish hearts to make felt tree decorations this year – thanks for the great info. However, I’m really trying very hard not to make the peanut butter cups or peppermint bark – I have a feeling those are gifts I’d be giving to me! …and like you on Facebook! I’m subscribe on google friend connect! I also tried the marshmallows and it was a lot of work! I roped my mom into helping me with them and she hated it and vowed to never try making them again. But I’m gonna see if I can get her to try making them with me again this year. I just followed. Thanks for the chance to win some awesome goodies! Also, just “liked” you on Facebook! Yay!